Love and Ferris Wheels just go together! February 14 is not only Valentine’s Day, but also National Ferris Wheel Day! 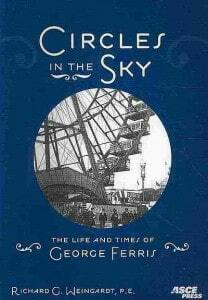 It is the birth date of George W. G. Ferris, Jr. and he is credited for creating the first large, steel amusement ride – the Ferris Wheel. That first Ferris Wheel was unveiled in the summer of 1893 at Chicago’s World Columbian Exposition. It was the first international exposition held in the United States and the committee wanted an engineering marvel that would overshadow France’s Eiffel Tower. Having recently ridden a fifty-foot wooden “observation roundabout,” which had been built and soon would be patented by William Somers, Ferris was inspired to enter the competition with his paper-napkin drawing of an enormous park ride. The constructed 45-foot axle-wheel powered by two 1,000 horsepower steam engines was supported by two 140-foot steel towers and it carried thirty-six wooden cars 264 feet high into the air – taller than any existing buildings! Since the original Ferris Wheel, the world has continually been trying to out-do it. In 1897, a copy of the original was erected in Prater Park, Vienna , Austria and became the longest running Ferris wheel in history. In 1904 the Ferris wheel was again the centerpiece of the World’s Fair, this time in St. Louis. The Texas Star was built in Italy and shipped to Dallas, Texas in 1985. It was, at that time, the tallest operating Ferris wheel at 213 feet (that is 52 feet shorter than the original 1893 wheel). The London Eye, at 443 feet, opened to the public in 2000. The Singapore Flyer, at 541 feet, became the tallest Ferris wheel in in the world in 2008. The 682 foot tall Beijing Great Wheel was supposed to be built in 2009-2010, but the parent company went into receivership and it was never completed. 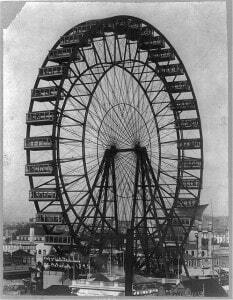 The original Ferris Wheel had 36 cabins and each one was able to carry 60 people for a total of 2,160 people per ride. There were fancy wire chairs for 38 passengers and five large plate glass windows. The cabins were 24 feet long, 10 feet high and weighed 26,000 pounds. A conductor rode in each cabin to allay fears and answer questions. Currently, the world’s largest Ferris wheel – or Observation Wheel – is the High Roller in Las Vegas across from Ceasars Palace. It is 550 feet tall, 107 feet taller then the London Eye. In contrast to the original Ferris Wheel each of the 28 cabins is 225 square-feet and weighs approximately 44,000 pounds. Each cabin has a diameter of 22 feet and includes 300 square feet of glass. It also has 8 flat-screen televisions and an iPod dock. 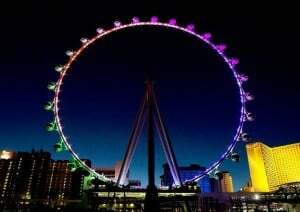 The High Roller is lit by 2,000 LED lights which have multiple lighting options. Looking for that special Valentine’s Day destination wedding? You can book a VIP cabin on the High Roller and have the wedding of your dreams! Find the nearest Ferris Wheel and maybe, just maybe, fall in love? Alkaline batteries, lithium-ion batteries, potato batteries, but frog batteries?